Camide Eye Drops (Tropicamide) is an anticholinergic drug, having mydriatic and some cycloplegic activity. It has a rapid onset of action (15-30 minutes) and a short duration of action (4-6 hours). Used mainly for mydriasis and cycloplegia for diagnostic purposes and for the treatment of some cases of acute iritis, iridocyclitis, keratitis and post-operative cases. 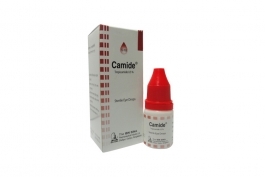 Camide is available as 5 ml opthalmic drops.